Odessa Begay, Edgar Allan Poe: An Adult Coloring Book. Sterling Publishing, 2016. Pp. 96. ISBN 978-1-45492-135-6. $14.95. 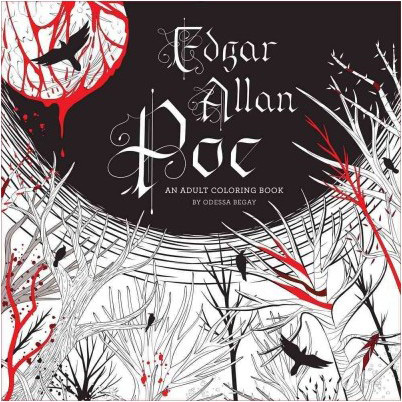 Edgar Allan Poe: An Adult Coloring Book by Odessa Begay is a fun experiment in mixing the darkest literature with the playful experience of messing around with colours. The large, coffee-table format, and the very attractive cover with metallic-red details make this book something that won’t go unnoticed. Unfortunately, sometimes the quality of the drawings is not as good as one might hope, and the occasionally careless execution leaves one with the feeling of a missed opportunity. 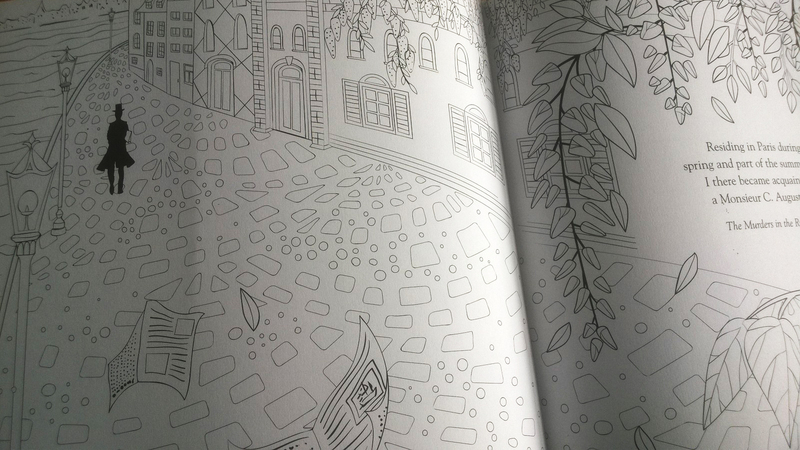 When colouring books started populating bookshops, and even stationery stores, I mostly ignored them. Even though, to be honest, I quite regularly visit both places. I had no prejudice against the growing number of people who turned out to be keen on this activity, just didn’t feel it was my thing, in spite of my general enjoyment of drawing and colouring. Then, last summer, when I was on holiday, one of my friends bought one of these books and brought it to the beach, so we could all colour together while lying on the warm sand. 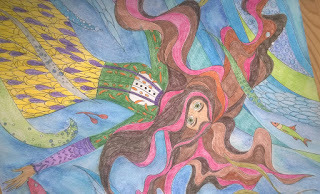 It was there, under the scorching sun of South Italy, that it clicked: my enthusiasm for colouring books was just born. Maybe it’s because of the strong association with kindergarten times (well, if kindergarden was a good moment of your life, of course. It was for me). You know, when you have all the colours chaotically around you, and when you look for the red and can’t find it you shout “who has the red?” and then realise that someone else is using it and they are not gonna let go, so, well, maybe pink will do all right… But besides triggering memories of enjoyable moments and facilitating some bizarre forms of socialisation, another thing that made that experience so pleasant was that it wasn’t about doing something “right”. It wasn’t about achieving artistic perfection, or even a passable result. It wasn’t about completing a task or meeting expectations. It was just about having fun. Pure, simple playing. 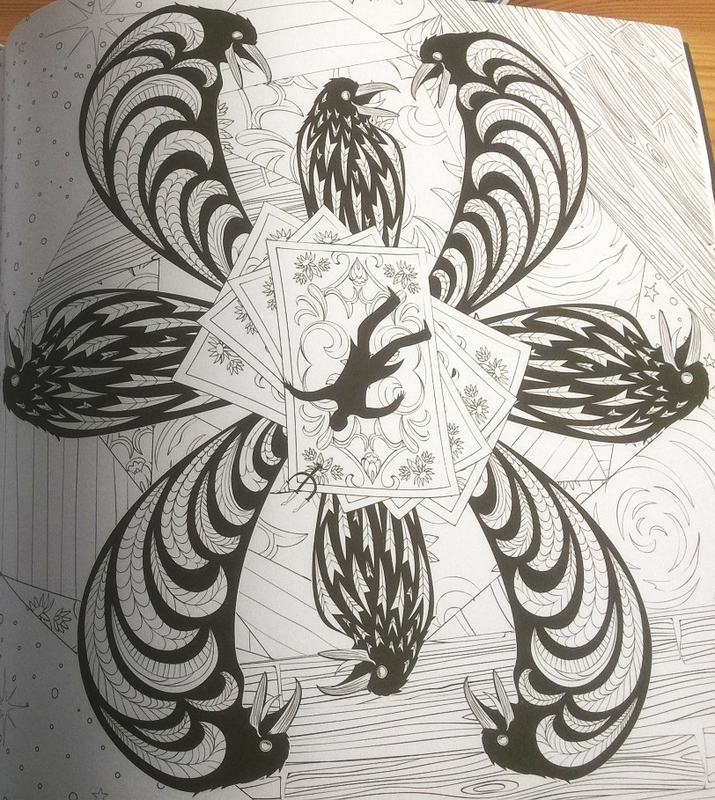 That’s why, when I saw that someone had thought of a colouring book inspired by the work of Edgar Allan Poe, I was curious and a bit excited. The idea of linking something that, for me, was so strongly associated with childhood, playfulness and crayon stains on my clothes, with the gloomy and dark Poe-esque imagery was kind of amusing. As if mourning bells were tolling outside, but kids thought it was to announce the afternoon break. I am not the biggest fan of realism in art, and it is even less of a concern for me when thinking of colouring books. So, in my view, colouring a book inspired by Poe’s work shouldn’t mean that the only colours allowed are bone-ivory, raven-black and amontillado-red. Actually, the idea of giving a makeover to Poe’s characters was part of the appeal. Why not bubble gum pink ravens? Or turquoise skeletons? It made me giggle. Sounded fun. And I still think that’s the main goal. It could be due to my too-high expectations, but when the book was delivered, I couldn’t help being slightly disappointed. The large, square format is very attractive aesthetically, and it is also a practical choice that facilitates the colouring. Even collaboratively if you enjoy sharing crayons and pastels with your friends. The quality of the paper is excellent. Heavy enough, but not glossy, so the strokes of colour stick better, even if you want to experiment with watercolours (as some people do… ). The book is clearly laid out with a lot of care and seems to be born from Begay’s genuine passion for Poe’s stories. Even the preface and the artist’s biography are nicely framed in gothic decoration, and, if you like, you can colour those too. A Poe geek could have probably recognised the inspiration for each of the double-page, themed drawings in the book. But Begay also provides a quote to accompany every illustration. 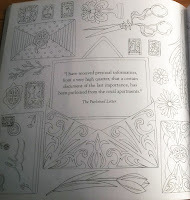 The combination of images and words is effective, and marks the difference with regular colouring books, underlining the literary inspiration of this one. The plates are a mix of illustrations of events, landscapes or characters described in Poe’s stories—like the street view from the “Murders in the Rue Morgue” (above)—and more conceptual compositions that bring together different objects, details or symbols somehow related to a story, like the variations on letters and old fashioned desk stationery in “The Purloined Letter” (right). A couple of compositions are particularly interesting, and show that the artist wasn’t just trying to produce something to fill up with colour but to give her interpretation of Poe’s work. The illustration for “The Raven” (below) is my favourite, possibly for the vaguely Hitchcockian flavour of the image. Unfortunately—and here come the reasons of my disappointment—not all the illustrations show the same level of quality. I understand that a good colouring book needs, for its practical purpose, to feature images not overwhelmed with details. But a drawing can be simple and still well executed. And I’m afraid it’s not always the impression a user would have when flipping through the pages of this book. The human figures especially appear often approximative in proportion and awkward in the posture. Too many of the details look like they have been drawn too quickly and with not enough care. Maybe that shouldn’t be the point. Maybe you don’t need good drawings to have fun colouring. But I do believe that better illustrations would have made me enjoy this book even more. In conclusion, I think that the idea was terrific. 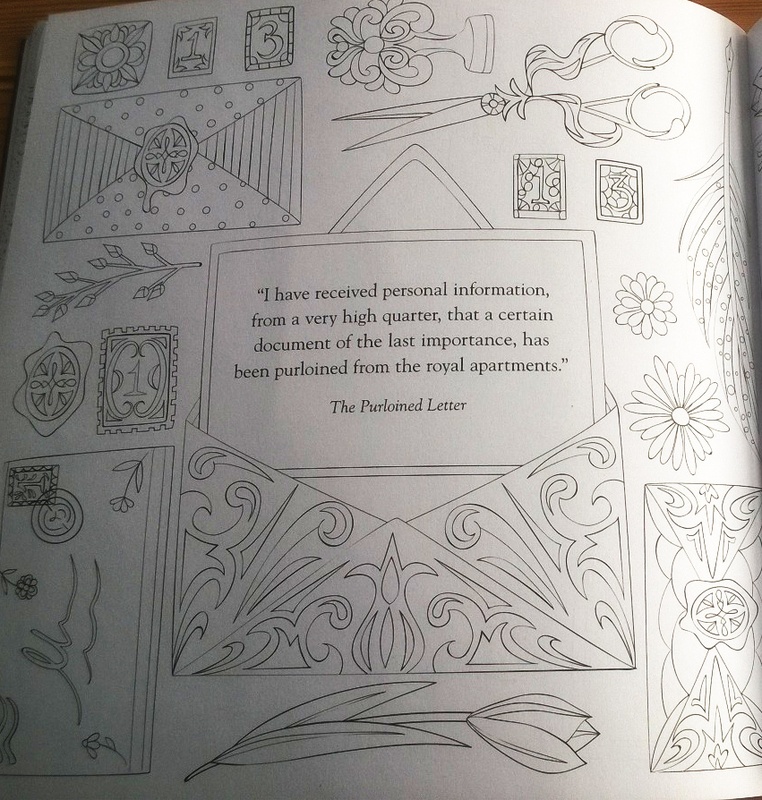 Pairing colouring books with famous work of literature sounds like a lot of fun to me. And if the choice falls on horror classics like Poe, there is even more added value. I liked the variety of the illustrations, and the idea of composing images mixing iconic details from the tales. The artist doesn’t illustrate literally the scenes from the stories, but is often very imaginative and original. I loved that the pages were showered in skulls, bugs, rats and ravens, as I expected them to be. I just wished a little more care was put into the actual process of drawing. I would still recommend this book, because I sincerely enjoyed playing with it. But I can’t shake off the feeling that, with a little more effort, it could have been great. While I was colouring surrounded by my army of bright pastels, I could almost picture Mr. Poe himself shaking his head, slightly horrified at what I had done with all his dark tales and morbid atmospheres. Well, dear Edgar, you know I’ve always loved you. You know I still find your stuff amazingly written. But you have contributed so much to the ubiquitous misogyny of the horror genre, with your beautiful, dead, young ladies, that you can’t really complain if I take a little revenge making “Marie Roget” look fabulous. And, honestly, I don’t care if you do.